Having been away from home and my wife for three weeks, I was looking forward to watching John Ford's The Quiet Man. John Wayne gets to show his more sensitive self, Ireland shows its green--welcome after the early Mediterranean browns of California's spring rather than the green spring of Iowa. Maureen O'Hara gets to show her feisty self to best advantage . . .
And I was moved by Wayne's interpretation of fighter Sean Thornton who has vowed to keep his fists out of the fight. And I did enjoy the green fields heavy with recent rain. 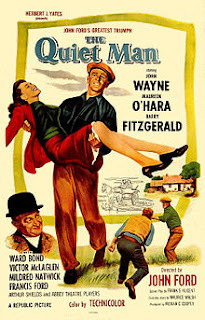 (The Quiet Man was the first American major film to have footage shot in Ireland.) Maureen O'Hara was the "fiery Mary Kate," damned if any man was going to tell her what to do and damned if she would love any man who wouldn't and couldn't. It was the stereotypes that got to me: men violent to women and brawling as a pastime; drunkenness as a national pastime; smoking as the essence of virility. After a while, I had to enjoy the film in spite of its assumptions. This film was released in the year of my birth. Thank god my growth and my generation's was away from many of the social beliefs of that time. We are a diverse world, and I'm glad to have that understanding as part of who I am. The Irish aren't all drunken brawlers any more than all Americans are violent, gun-packing mobsters. The movie, though, has its sweet and humorous moments--it's just too bad that when Sean Thornton, aka John Wayne, finally has his epiphany, the resolution of the conflict is determined by who is the best brawler and boozer. With Irish music in the background. And, yes, I did cry at times during the flick. I really miss my wife.